We manufacture, export and supply Electromagnetic Flowmeter. The Electromagnetic Flowmeter is a new range of Bipolar Pulsed DC Full Bore Type Electromagnetic Flowmeters. Electromagnetic Flowmeter is suitable for pipes with diameters of 10 mm to 1000 mm. It is based on Faradayâï¿½ï¿½s law of Electromagnetic Induction. The meter features flanged construction of Electromagnetic Flowmeter available with choice of Liner and Electrode materials. 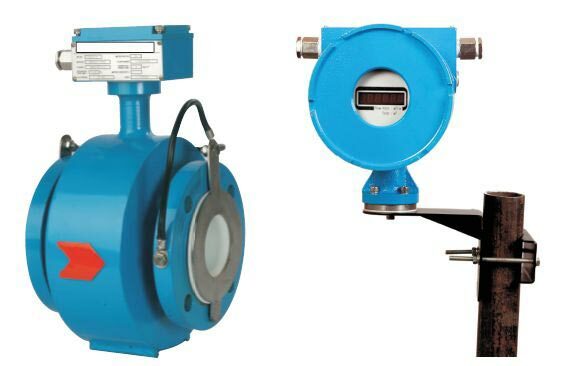 Electromagnetic Flowmeter has excellent accuracy and flow range. The Electromagnetic Flowmeter is suitable for use on wide range of corrosive and aggressive range of conductive liquids. Based on Faradayâï¿½ï¿½s law of Electromagnetic Induction.